Google Assistant is a voice assistant enabled on a wide range of Android devices, including smart speakers, phones, wearables, TVs and others. You can extend functionality of Google Assistant with Actions on Google. Aimylogic implements an integration with Actions on Google thus you can easily create an action for Google Assistant. All you need - is to create a bot in Aimylogic. There are a couple of steps you have to do to create an action for Google Assistant. First of all you have to enable Google Assistant channel in your bot. Please go to Channels menu and click on Google Assistant button. A settings window appears. Just click on Connect button. A new channel will be appended. Click on the link "Download action.json" to download a JSON file. This is your action manifest. You have to upload it to your project in Actions Console. Each Action for Google Assistant is represented by a project in Actions Console. Please go to Actions Console and click on Add/Import Project button. 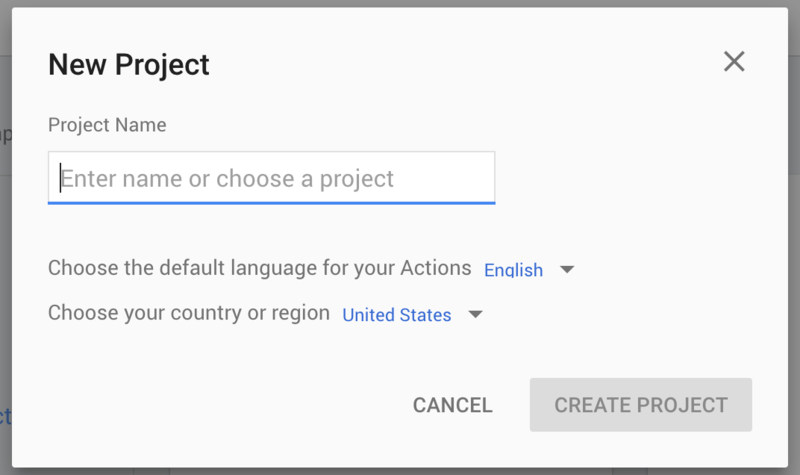 Type some name for the project and select a language of your action. Click on Create Project button and then select or skip a category. Go to the Invocation menu and type some invocation name for your action. This name is used to activate your action in Google Assistant. Click Save button after this. To upload a JSON file to your action you have to know it&apos;s project ID. Go to the Settings menu and copy Project ID string. To upload your JSON manifest to your project in Actions Console you have to use gactions tool. Just download an appropriate version. Copy an URL from the screen and open it in the browser. Sign in with your account used in Actions Console then. Copy the an authorisation code and paste it back to the terminal and press Enter key again. Thus your action package will be uploaded now and your action will become ready for test. Once you&apos;ve uploaded your action package to the project in Actions Console, you are able to test the action on the real device or in the test console. Just ask Google Assistant to run your action using invocation name you&apos;ve added on step 4 of this guide. Please note that Google limits some features in Actions. Please learn more about these limitations here.